My thoughts: I've always thought hats were so chic and stylish, even though I can't pull one off. What drew me to this book was that it focused on a hat maker. While the plot didn't delve too much into the hat making process, the plot was intriguing and flowed easily. I found it odd that Nell put up with so much of Oscar's attitude. I think it all just stemmed from feeling like she had to bow down to superior males in her life. The ending was somewhat abrupt, but it was nice to see Nell finally found her place in life. It was incredibly obvious the author was setting everything up for her next novel, and the way the story happened around that was a bit too obvious. It was kind of awkward. I don't want to give too much away, but a very minor character is part of a scene and it's odd how much the author focused on that for a page or two, then no one discussed it again. Overall, I enjoyed the book. 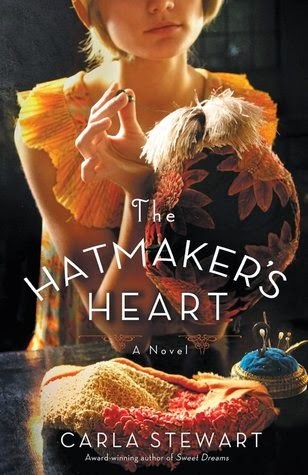 I'm not sure if I would read the next book about the minor character from this book, but I'm glad I read this one and would actively search out more books about hat making based on what I learned in this book.